"The phrase was theorised in a statistical book on the failures of children in council estate environments back in 1971," Matthew Miller explains. 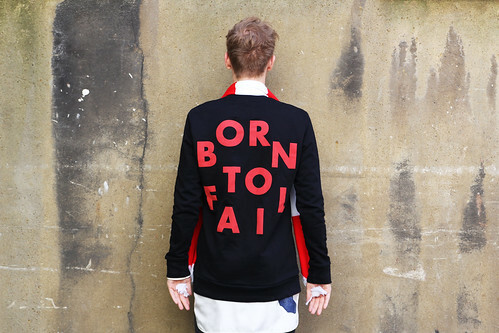 Appropriated for autumn/winter 13, the slogan graces a ribbed jersey crew neck (available at Other and Peggs & son) and feels particularly apt on North London Derby Day. Wrapped up in a red and white scarf and enveloped by nerves, this fan and jumper wait in hope. With so many slogan tees and sweats around, it is great to see that some people are finally starting to be a bit creative with their texts. Great color composition. Love this blog so much! :) Thumbs up!maybe we could follow each other on Bloglovin and/or GFC, Facebook? Protecting your private parts securely and in the most stylish way during bodybuilding competition is very essential. In bodybuilding competitions, you need to capture the attention of others with your physic. So, it should be adorned in the most stylish way. You can do it by using the swim suits of Vandella costumes. These suits are specially designed for participating in these types of competitions. You can also outperform your opponents if you wear these swim suits. Description" content="Trendin.com has widest range of collections. You can buy people jeans online from our store. Buy men’s jeans online at affordable prices and get free shipping and cash on delivery. Description" content="people sweaters are good and keeps you warm and protected. Buy people sweaters, men’s sweaters online at our online store trendin.com. Free shipping and cash on delivery"